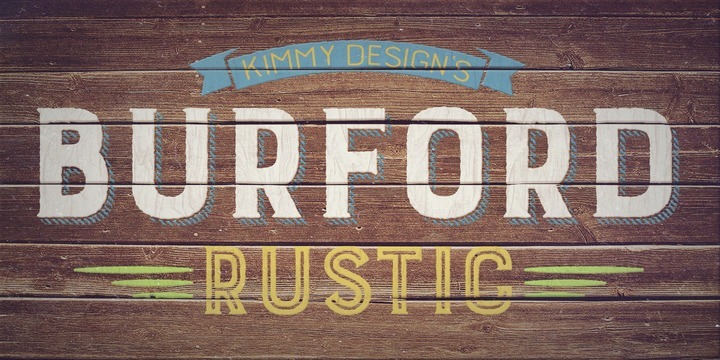 Burford Rustic is a textured layer-based typeface created by Kimmy Kirkwood and published by Kimmy Design. It offers style and texture variations (from Black, Bold, Light to Ultralight) and layering alternatives. It also contains Outline and two Inline Weights (with three line weights), Stylistic alternatives and Contextual alternatives which allow the user to create individual letters. Besides all these features, it provides a complex ornament set (which includes banners, borders, corners, arrows, line breaks, catchwords, anchors) and the proper tools for the designer to develop a wide range of graphic projects (from fine print, posters, logo, headline and editorial design). A font description published on Wednesday, April 29th, 2015 in Fonts, Kimmy Design, Kimmy Kirkwood by Iulia that has 6,142 views.